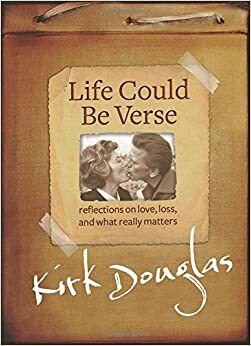 In Life Could Be Verse, a brief and often affecting volume, actor Kirk Douglas, who recently turned ninety-eight years old, shares poems he has written over the course of his long life and recounts the experiences that inspired the verses. Kirk wrote his first poem -- about a sailing ship, though he had never seen the ocean -- for an English class assignment as a high school student in upstate New York back when he was still Issur Danielovitch, the child of impoverished Russian Jewish immigrants. He discovered that versifying helped him better understand his thoughts. "Throughout my life I have written poems that express my true feelings," Kirk explains in the book's acknowledgments. The poems are simple but perceptive reflections set in singsong rhyme and might be called wise doggerel. Here are the opening lines from "Luck" -- They call it 'luck'/It can't be taught/It can't be borrowed/It can't be bought'. Kirk's movie stardom, though discussed in the book, takes a back seat to his roles of son, husband, father, and grandfather. Kirk Douglas is among the few classic studio-era stars still with us in this second decade of the twenty-first century. Olivia de Havilland, Maureen O'Hara, and Doris Day are others. His trademark thick blond hair has turned thin and white and is worn in a ponytail. In Life Could Be Verse Kirk quickly runs through the highlights of his acting career which began on the New York stage in the late 1930s. There were a few years of struggle and a stint in the Navy during World War II. 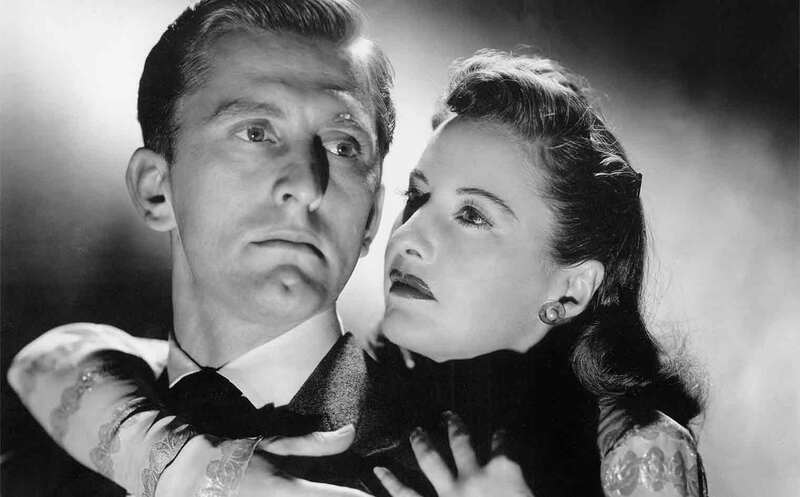 The big break came in 1945 when producer Hal Wallis (following a tip from young Lauren Bacall, who Kirk had briefly dated when she was a Manhattan teenager named Betty) caught Douglas's performance in the play The Wind is Ninety and lured him to Hollywood. Strange Love of Martha Ivers (1946). To illustrate one of the main points of Life Could Be Verse -- that blunders big and small are inevitable and the best we can do is learn from them and move on carrying greater wisdom -- Kirk relates how he showed up on the set of his first film, The Strange Love of Martha Ivers, having memorized the wrong part on his train trip west. "I apologized and picked up the script as I tried not to hear the tittering laughter of [the film's leading lady] Barbara Stanwyck," Kirk recalls. The boxing drama Champion (1949) established Kirk as a major star. He went on the make approximately ninety films but his turns as Vincent Van Gogh in Lust for Life (1956) and a slave revolt leader in Spartacus (1960) may be the only Kirk Douglas roles that a non-movie buff can name. Betty Joan Perske, in Young Man with a Horn (1950). The Committee Room's favorite Kirk Douglas film is Young Man with a Horn (1950), about a brilliant but troubled jazz musician and loosely based on the life of Bix Beiderbecke. His co-stars were old friend Lauren "Betty" Bacall, as a wealthy sophisticate the young man unwisely marries, and Doris Day as the band singer who really loves him. This was the only time any of these performers, whose careers were concurrent, ever worked together. That Kirk appeared only once with Bacall is somehow surprising. That he worked with Doris even this once is more surprising. Kirk and Doris seem to come from different planets in the movie universe. written before he mellowed with age. Kirk's own favorite of his films is Lonely Are the Brave (1962) about a modern day cowboy trying to live by the code of the Old West. "I love the theme that if you try to be an individual, society will crush you," Kirk wrote in The Ragman's Son (1988), his frank and decidedly unpoetic autobiography. The film that proved most important to Kirk's personal life is Act of Love (1953), a now forgotten melodrama set during World War II. While in Paris making the film Kirk met his second, and it would seem final, wife Anne Buydens, an attractive and worldly young publicist assigned to the film. Kirk and Buydens married in 1954. "I have made many mistakes in life. This was not one of them," Kirk says of his second marriage in Life Could Be Verse which is dedicated to Anne. Among the most touching of Kirk's poems was written after Anne was injured in a fall in their home and had to be hospitalized. Kirk pleads -- Let me go before my wife/Without her I have no life. and daughter in law Catherine Zeta-Jones. The uxoriousness on display in Life Could Be Verse contrasts sharply with the tone of The Ragman's Son, in which Kirk's candor, some might call it braggadocio, in regard to his busy life as a ladies' man makes it easy to forget he has been married for most of his adult life. Marlene Dietrich, Joan Crawford, Ann Sothern, Gene Tierney, and Rita Hayworth, are among the A-listers who seem to have been more than friends with Kirk. Kirk's first wife, the actress Diana Douglas, to whom he was married from 1943 to 1951, is the mother of his famous son Michael. 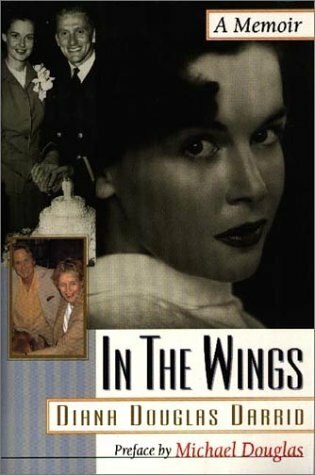 For the record, Diana Douglas, a working actress in stage and television, penned her own entertaining memoir In the Wings (1999). The acerbic Diana, who refers to Kirk somewhat dismissively as "Doug," writes about her affair with Errol Flynn and the challenges she faced raising her sons while maintaining a busy but relatively modest acting career. With perhaps a tinge of envy, she questions whether the level of stardom held by her ex-husband, her son, and other celebrated people she has known, is really something to be desired. Memoir by Kirk's first wife (1999). Today, Kirk's oldest boy, no whippersnapper himself at age seventy, is perhaps more famous than his father. There is, as readers will likely expect, a poem about Michael in Life Could Be Verse. In "Michael" Kirk writes -- I became a 'good father'/It took me too long to see/When I needed him/More than he needed me. Kirk Douglas was once among the most driven and abrasive of Hollywood's top performers. These qualities are very much in evidence in The Ragman's Son but almost entirely absent from Life Could Be Verse. In the quarter century between the autobiography and the book of poems, Kirk survived a helicopter crash, suffered a stroke which left him having to relearn how to speak, and experienced the death of his youngest son, Eric, from a drug overdose. In the poem "Eric," Kirk writes -- Tell me, Eric, what did I do wrong?/What should I have done to make you strong?/Now I sit here and cry/Waiting to be with you when I die. 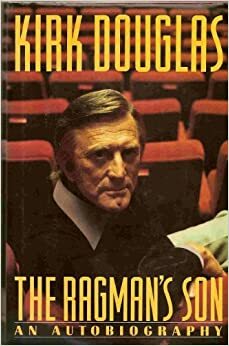 Other books by Kirk Douglas include My Stroke of Luck (2002), Let's Face It: 90 Years of Living, Loving, and Learning (2007) and two novels: Dance with the Devil (1990) and The Gift (1992). He has also performed a one-man autobiographical stage show, Before I Forget (2009). I read this book purely for the novelty of it - a famous actor writing poetry? Who doesn't want to know what THAT sounds like? And let's be honest - I don't expect him to be a contender for Poet Laureate any time soon. But the poems are sweet and heartfelt, and each carries with it a snapshot of what has been a fantastically complex and interesting life. My only real complaint is that I wish the book had been longer - Douglas comes across as warm and funny, and I would have enjoyed hearing more stories from his 97 years Paperchoice.org Review . Recommended for Kirk Douglas fans or Hollywood fans. 8 Bonuses and winnings will be withdrawn if the turn over target is not reached as of the deposit date or there is an identified fraud in the ip address, account number, account name. When you do not really know much about scm systems, your initial reaction might be to ignore the need to invest in such software. The same goes when you are having trouble with cargo and logistics management, but prefer finding temporary solutions.